The third cat in JoAnn’s troupe is Roman. If you missed them, Herman and Comet are the other two of the four. I met her and the friendly furballs on Christmas Day this year. They get four hours of outdoor run-around time each Friday, Saturday, and Sunday. That’s regardless of weather! The shelter called the cat something else. “Roman I thought was such a prestigious name”, she says. “Almond was such a stupid name”. 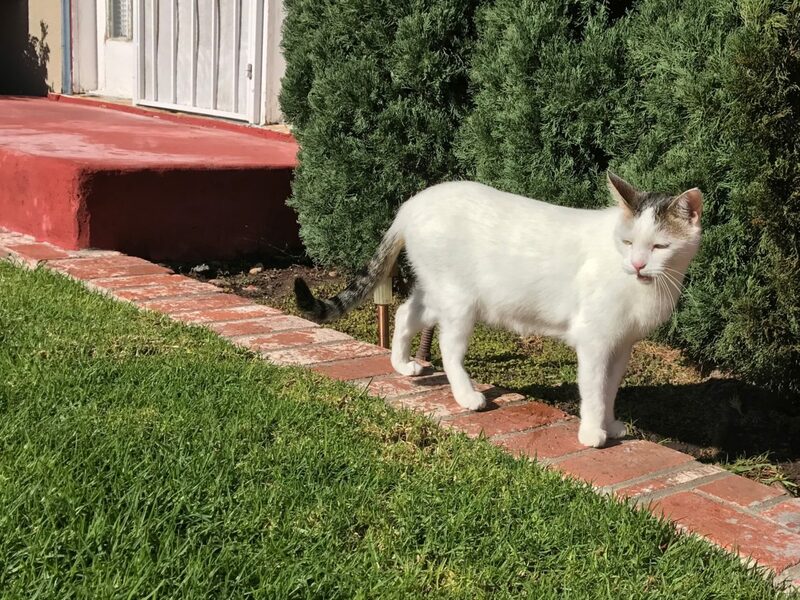 I agree, and what is there almond-like about this white kitty with distinctive tiger-stripe tail? He is eldest of her brood but least in pecking order. When giving out Christmas treats, JoAnn observes that he waits until the other animals finish before eating. Roman has been with JoAnn for about 10 years, and she estimates his age at 14. All four felines are trained for cues about workdays and play days. “They know it, too”, she says about weekends. 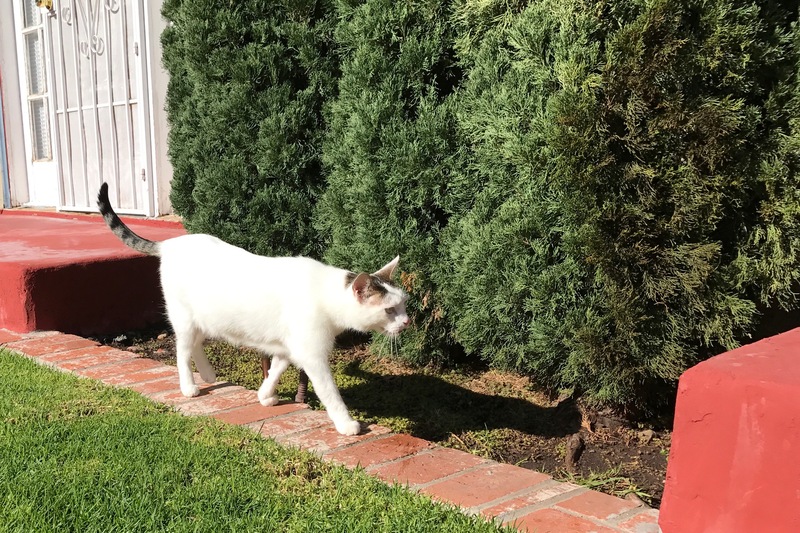 “Cats need to have their outdoor time”—and it’s all fairly supervised; she sits outside her studio apartment of 19 years as they jaunt around the courtyard, onto the sidewalk and even across the street, where, on Campus Ave., there are San Diego School District administrative offices. I captured the moments using iPhone 7 Plus. Vitals for the Featured Image: f/1.8, ISO 20, 1/2660 sec. 3.99mm. The other, which catches Roman in mid-meow, is same except shutter: 1/2907 sec. I shot both photos at 12:28 p.m. PST. The other featured felines: Scruffy, Roly Poly, Woo, Skull, Biscuit, The Colonel, White, Chipper, Frisky, Stretch, Needy, Farfisa, Mates, Hunter, Pee-Pee, Blue, Blue Too, Bonded Pair, Patience, Fess, Jumper, Frenemy, Looker, Cozy, Scout, Lurks, Skit, Mini, Betty, Black and White, Stalker, Bell, Chill, Sammy, Scratch, Poser, Star, Grey and White, Watcher, Herman, and Comet.